Of course, New Jersey Governor Chris Christie (R) would rather do away with the formalities and tear down the divider in the self-serving name of “compromise.” That strategy is at least respectable insofar as it is somewhat more aboveboard than the currently sustained illusion. However, compromise in any context is only a legitimate pursuit when the involved parties in a dispute agree on the objective(s) but simply disagree on the means. If I were to hypothetically insist that you owe me the permanent use of your property as an end, are you then ethically obligated to compromise with me on this objective? When political “moderates,” who offer no discernibly substantive difference between themselves and their ostensible opponents, vilify others for sticking to their principles – however right or wrong they may be perceived – they showcase their own definitional set of compromised principles. If one agrees or disagrees with the “extreme” liberals and/or conservatives in society and politics, the legitimate way to combat their ideas is by providing substantive and relevant counterpoints to those ideas with better ones. Simply labeling opponents as uncompromising, as if compromise is a legitimate end unto itself, is an utterly meaningless rebuttal. People who claim to possess actual principles are not supposed to compromise them simply because others insist they should. There is of course a fourth option: respect for the individual and his/her rights and freedoms; deference to the Constitution as the Supreme Law of the Land; and willful rejection of infringing populist sentiments, discriminatory electoral majoritarianism, and the de facto rule of the special interest minority. The only political principle that can both ethically and practicably govern a heterogeneous nation of over 300 million individuals is the notion that free people possess the natural right to do, say, believe, and pursue anything s/he wishes, provided doing so does not infringe upon the rights, property, or mutual contractual agreements of others, and that said individuals are entitled to the positive and are responsible for the negative consequences of their actions and decisions. 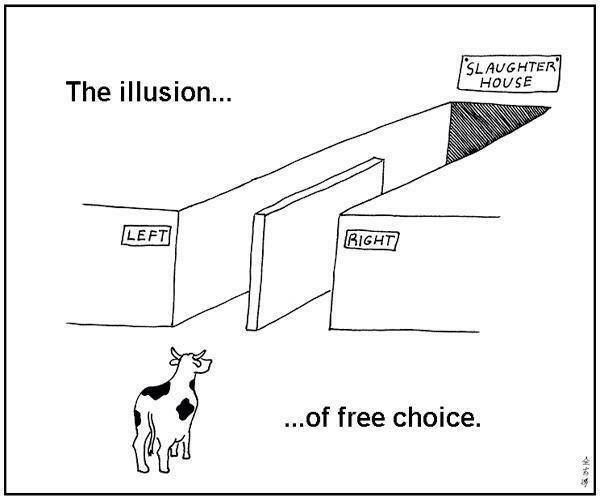 The obvious challenge presented here is whether or not people can uncompromisingly embrace the ethics and principles necessary to prevent the proverbial slaughter that is sure to come if the individual’s rights and freedoms continue to be disrespected under the auspices of “moderation.” The easy choice and the right choice are often not the same. This entry was posted on November 8, 2013, 8:22 PM and is filed under Observations. You can follow any responses to this entry through RSS 2.0. You can leave a response, or trackback from your own site.